NAITA is pleased to announce a new date for the NAITA FMS Industry Day with USASAC originally scheduled earlier this year. 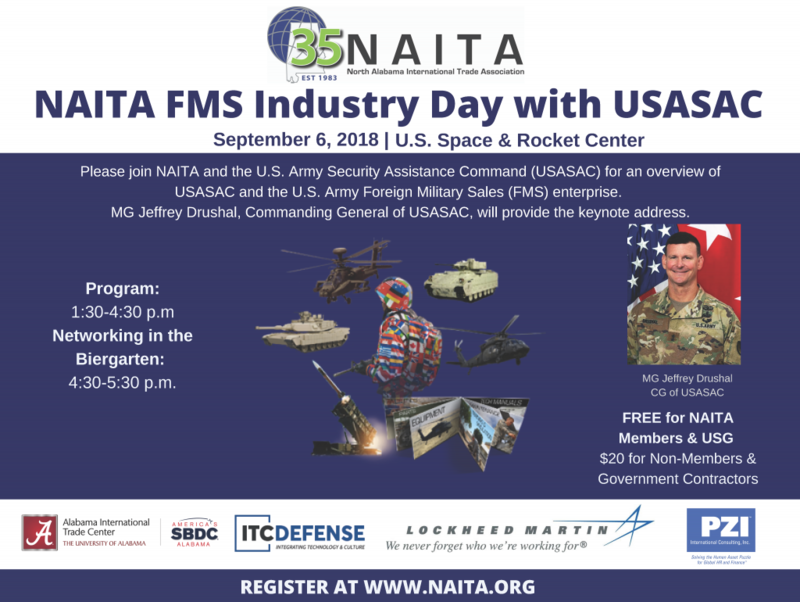 The NAITA FMS Industry Day with USASAC has been rescheduled for Thursday, September 6, 1:00 – 4:30 p.m., in the National Geographic 3D Theater in the Davidson Center, at the U.S. Space & Rocket Center. 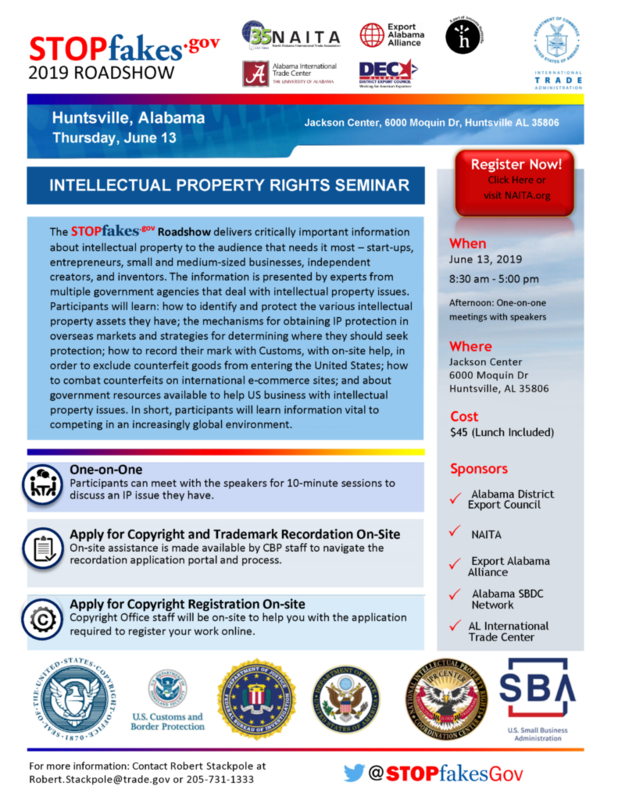 The briefing will be followed by a reserved area for networking with our speakers and attendees during the Biergarten in the Davidson Center at the U.S. Space & Rocket Center. Major General Jeffrey Drushal, Commanding General of the U.S. Army Security Assistance Command (USASAC), will provide the Senior Leader Perspective on Security Assistance, and this will be MG Drushal’s first major speaking engagement in Huntsville since assuming command of USASAC in July. Additional speakers include USASAC Regional Operations Directors discussing FMS Business Across the Globe, industry partners discussing Large Company Challenges and How Small Business Can Help, and an Export Control Update from the Office of the Deputy Assistant Secretary of the Army for Defense Exports & Cooperation (DASA-DEC). 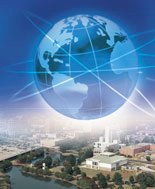 Please click here for the FMS Industry Day agenda. USASAC is a subordinate organization of the Army Materiel Command, the primary provider of materiel to the United States Army. Employing more than 1,900 Soldiers, Department of Army Civilians and Contractors throughout the globe, USASAC leads the AMC security assistance enterprise, developing and managing security assistance enterprise programs and foreign military sales. The FMS mission is a fundamental tool of U.S. foreign policy and will continue to play a critical role in the Army Operating Concept 2020-2040 by shaping the environments of geographic Combatant Command (COCOM) regions to build partner capacity. As Strengthening Partnerships is a top priority for senior Army leadership, USASAC’s mission will bolster our nation’s ability to fight and win our nation’s wars today and into the future. USASAC currently manages more than 5,800 FMS cases in more than 150 countries with a total case value of more than $180 billion. For more information about USASAC, visit https://www.army.mil/info/organization/usasac/.